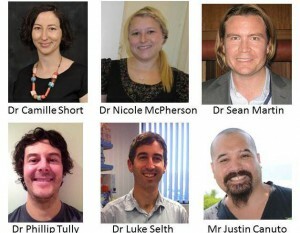 The Centre is very pleased to congratulate the following young members of the Centre for their outstanding achievement in the 2014 Commonwealth NHMRC and National Heart Foundation (NHF) research funding outcomes. The NHMRC and NHF are both highly competitive peer reviewed application processes and therefore these outcomes are a testament to the high calibre and commitment of these young researchers. Dr Luke Selth was awarded a three year NHMRC project grant for his research on “Targeting microRNA-driven mesenchymal to epithelial transition to suppress prostate cancer metastasis”. Dr Camille Short was awarded a NHMRC Early Career Fellowship for her research on” Advancing population approaches to physical activity promotion among cancer survivors: The development and evaluation of an innovative web-based intervention”. Dr Short submitted her application while at Central Queensland University. Ms Nicole McPherson was awarded a NHMRC Early Career Fellowship for her research on ” Sperm methylation status predicts embryo and pregnancy outcomes in male obesity”. Dr Sean Martin was awarded a NHF Early Career Fellowship for his research on “Understanding lower urinary tract symptoms (LUTS) as a marker of cardiovascular disease in men”. Dr Phillip Tully was awarded a NHF Vanguard Grant for his clinical project “Cardiovascular health and anxiety mood problems: CHAMP pilot study”. This entry was posted in News and tagged grants, men's health research, NHF, NHMRC, young scientists. Bookmark the permalink.